Matthew Buffalo plays several roles, including struggling L.A. actor Alex More, in Island City Stage’s production of Buyer & Cellar. 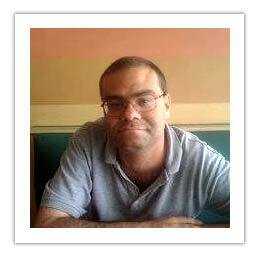 WILTON MANORS, Fla. — If Alex More were a real-life struggling actor, you probably wouldn’t want to roll up his sleeves if you cannot stand the sight of injuries. Surely, those limbs would sport huge red marks, or even bruises. After all, if you were More, how could you not want pinches to ensure that what you just experienced were real? It all sounds so implausible. Working for and interacting with a megastar such as Barbra Streisand in her luxury Malibu residence? Operating a “shopping mall” in the basement of said residence? Yes, it sounds far-fetched. Indeed, it seems to only happen in someone’s deep, serene slumber from which you dare not awaken them. 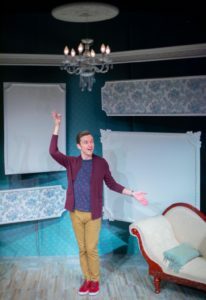 But nobody’s sleeping in the award-winning Buyer & Cellar, the clever and cleverly-titled Off-Broadway hit that delivers jolts of much-needed fantastical whimsy. 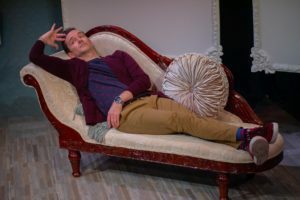 Undoubtedly, those wide awake include the audience – especially in Island City Stage’s (ICS) lively production of Jonathan Tolins’ satiric, implausible, yet delightful play. Tolins has set his play in 2013 in Malibu, Calif. The two-time Carbonell-Award-winning ICS’ captivating mounting, which opens its season, runs through Dec. 2 in Wilton Manors, near Ft. Lauderdale. In fact, the staging is so engaging, it’s sure to perk you up like a visit from Santa a month early. Moreover, widely-traveled and prolific performer Matthew Buffalo, who mimes almost all actions without props, imbues Alex with an irresistibly enlivening nature. The actor, exuding nervous energy, can barely contain his ardor. As a result, you’ll smile so often and for so long, the only part of your body hoping for a nap will be your cheeks. To be sure, Tolins’ fantasy stretches the limits to which many might be willing to suspend disbelief. Indeed, the jaded might use adjectives such as implausibility to describe the play. Who, you might ask, keeps a shopping mall, complete with the names of establishments, in their basement and employs a cashier to run it? Then again, if you’re asking that question, you probably haven’t read Streisand’s book, “My Passion for Design.” It includes a description of an unusual but apparently effective way to organize collectibles. And someone has to serve as check-out clerk when the “Lady of the House” isn’t around. So, why not More? As it is, he’s apparently having trouble keeping a job requiring constant interaction. Fortunately, he hears about Streisand’s weird job opening. And it’s a rather solitary position. The only customer is Streisand herself. Now, it’s rather a stretch to believe that Streisand is unfamiliar with her objects. During her visits to her basement, the diva asks the young actor questions about belongings, including their origin. In addition, she negotiates buying prices. At this point, Buffalo narrows his eyes, endowing More with a competitive aura. But forget all the hard-to-believe conversations and situations. Just go with the flow. Accept and have as much fun as Tolins obviously had when he researched and wrote the piece. Humor him and his fertile imagination. In turn, he’ll offer plenty of delightful absurdism and fodder for thought. For example, the writer playfully explores the price of fame, celebrity and material things, our quest for the highest levels of achievement and the conflicted feelings between gay people and divas. Tolins examines such a relationship mainly through Alex’s boyfriend, Barry. Buffalo plays him, Streisand a couple other characters. And the charismatic performer offers a whirlwind of a performance. Surely, you’re glad a water bottle’s on stage — beads of sweat form on his forehead as the play progresses. To switch characters, Buffalo merely turns the other way, changes posture and vocal inflection. It all happens so smoothly in less than two hours with an intermission. No doubt, credit for that fluidity goes to director Andy Rogow’s direction and lighting designer Ardean Landhuis’ excellent work. The designer helps create focus, variety, transitions and mood, with intense and softer lighting and color. Meanwhile, scenic designer Jodi Dellaventura has created a lavish and spacious set to depict Streisand’s upscale home. Into this paradise steps a wide-eyed Buffalo, filled with barely-containable enthusiasm, as well as a flair for the dramatic and storytelling. But why is he wearing a microphone in such an intimate theatrical space? Clearly, he has no problem projecting. The performer sincerely conveys a myriad of emotions. For instance, sarcasm and bitterness drip from his mouth when he plays Barry. The high-strung, opinionated man can’t believe Streisand still complains about her hard upbringing after she’s experienced so much fame. Poor Barbra, Barry opines. She had it rough growing up, when nobody told her she was pretty. Now, that slighted “little girl” practically graces the cover of every magazine out there. Does she really have a right to complain, what with the lavish lifestyle she’s living and people paying so much attention to her? But do we really know what it’s like to be rich and famous if we we’re not? Tolins apparently wants us to consider this. To hear Barbra describe the lifestyle, it doesn’t only result in happiness and a glamorous existence. As a matter of fact, living “the life” can feel as lonely as More might feel in his solitary job, Tolins suggests. Still, More wants, well, more out of life. He’s not even completely satisfied working in a basement, albeit one belonging to Streisand, whose persona he suggests more than mimics. More wants to get upstairs into Streisand’s dwelling. Symbolically, this suggests he wants to reach the top of his field, to be on the same level as a star. No doubt, this down-on-his-luck actor has a dream. And if he cannot fully achieve it in real life, at least he can be part of one involving Streisand, in fantasyland. And so, in just one of several fond references to musical theater, he suggests Streisand play Mama Rose. Meanwhile, he would coach her and play the other parts. Clearly, by the end, Streisand has impacted More. And surely, this lively and witty play will impact audiences, perhaps even in unexpected ways. Island City Stage’s season-opening production of Buyer & Cellar continues through Dec. 2 on the Wilton Theater Factory’s mainstage, 2304 N. Dixie Highway in Wilton Manors. Performances are at 8 p.m. Thursday-Saturday as well as 5 p.m. Sunday. Tickets cost $38. Reserve them at www.islandcitystage.org or call (954) 519-2533. Box office hours are 10 a.m. to 4 p.m. Monday through Friday. Alex Moore (Matthew Buffalo) relaxes in style.